*Not by any recognized group or award. Probably just nonsense cooked up by the author. 10. It's always helpful to know the future. I'm not saying you'll make millions in the stock market, but for a book published in 2010, it's pretty spot-on about plummeting gasoline prices in the mid-2010s. (And wait till you find out why.) You'll get to find out about future technologies (including what not to get too excited about on future TV) and learn when the aliens finally make themselves known. And "scatterjart." You've got to know about scatterjart. 9. You'll learn the most dangerous word to use in a public speech. Especially if you're ever a politician. God forbid. I can't tell you what the word is here, but I can tell you that it starts with "cons" and ends in "piracy." Now hush ... they're listening. 8. Your favorite corporate brand might make an appearance. Normally shameful, I know. But this book has no shame and hocks several brands. Now where's Elon Musk when you need him promoting your book? Is that redundant since they're in the title? But really ... you must get to know them. Funny and loyal, serious and suspicious, they make quite a team when trying to tackle an agenda that carries them beyond the borders of our world. 6. Hang with a celebrity. Because, you know, if enough people buy the book, we could pretend I'm a celebrity, and we can hangout by e-mail and maybe in video groups. It'll encourage me to keep writing things that don't really pay. And you can say, "I knew him when." You'll be referring to the time when I was already writing things that didn't pay. But we'll all be having fun! 5. Witness a political first. An honest politician. No, really -- a president who's brutally honest with the people, and who's fighting against special interests in the political process. Unless, of course, all isn't what it seems. 4. The end of cat videos? This book trailer is just a taste of the ridiculous that's in store. Buy the book and you'll do your part to encourage work on more of this drivel. Just maybe, this will one day rid the world of cat videos. All the cool kids are the first ones to read something and tell others about it. And we both know you're one of the cool kids. Let the others be followers. 2. The wit and wisdom. You have to grow old and wise somehow. 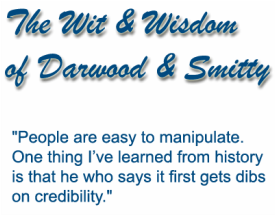 Darwood & Smitty can help the effort. It's full of it. Wisdom, I mean. Full of golden nuggets you can use and even quote in your next Power Point presentation. 1. Community, future books, and the word "FREE." I believe the future of communication is collaboration. I love the idea of engaging with readers and letting them help to craft books. In fact, this is what I'm doing with my fantasy series for kids, letting them illustrate books and contribute ideas for the fantasy world! I'd love to do more of this with my books for adults too, and hope that you'll engage. So whether or not you buy, read, love and REVIEW Darwood & Smitty, I hope you'll join my mailing list so we can stay in touch! Besides all this ... the book is FREE for kindleunlimited members and FREE to borrow for Amazon Prime members with Kindles. The Kindle version is also FREE for those who buy the printed version. So what're you waiting for? It's not every day that you have the chance to read about honest politicians. Or a gargantuan police force. Or the sheer and twisted fun of aliens gone wild. Come on ... it's all here with Darwood & Smitty.